Assistance upon arrival at Cochin Airport and transfer to Hotel. 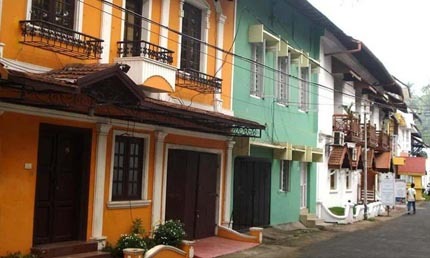 Cochin:- Is regarded as one of the beauty spot of India. 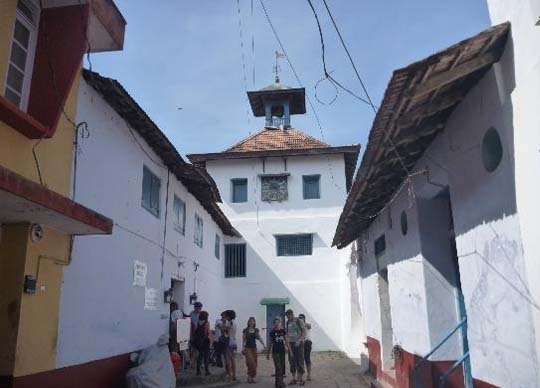 The port of Cochin is known as the queen of the Arabian Sea and the industrial hub of the state where the ancient civilisation mingles with the 20th century Cruising in the backwaters is a real pleasure and is the most fascinating way to observe the countryside. Jewish Synagogue :- the magnificent structure was built in 1568. The Great Scrolls of the Old Testament, copper plates of inestimable historical worth containing the privileges granted to Jews by the Cochin Maharajas, and the exquisite Chinese hand painted tiles are of great interest. Dutch Palace - was built by Portuguese and presented to the Maharaja of Cochin in 1568. At the centre of the building is a large coronation hall. Seventeenth century mural paintings depicting scenes from the India epic Ramayana can be seen in the Palace. St. Francis Church - was the first church to be built in India by the Portuguese. Vasco-de-Gama, who discovered the sea route to India from Europe, was buried here. Chinese Fishing Nets :- The old lingering remnants of the Chinese influence are the Chinese fishing nets still in use around Cochin. 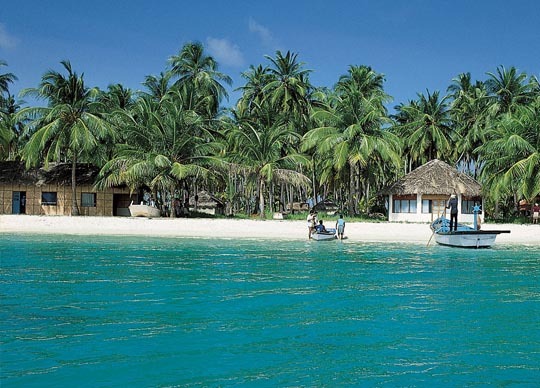 Bolghatty Island:- This long narrow palm fringed island, is situated amidst 15 acres of lush green lawns. Built by the Dutch in 1744, it became the seat of the British Resident. Pallipuam Fort Vypin - It is situated at the far end of Vypin Island. Small and hexagonal, it was built in 1503, claiming to be the oldest European fort in India. Open onThursdays only. Kathakali Dances: A performance of the traditional Kathakali dance is one of Cochin's highlights. This form of dance theater, dating back 500 years, can be seen nightly, with explanation and narration, all over the city. By tradition, all dancers are male and wear elaborate costumes and mask like make-up to mime stories from the great Hindu epics, the Ramayana and the Mahabharata. After breakfast transfer to airport in time to catch flight for Aggati. Upon arrival take a boat cruise for transfer to hotel. Rest of the day at leisure on the beach. Aggati- Agatti Island, also known as Agathy, is a 5.6 km long island, situated on a coral atoll in the Union Territory of Lakshadweep, India. It is located about 459 km off Kochi in the mainland and 7 km to the southwest of Bangaram, the nearest island. After breakfast take a boat cruise to Bangaram Island, where you can enjoy the water sports ie Snorkeling and Scuba diving or free for independent activities. Bangaram Island- Bangaram is an atoll in the Union Territory of Lakshadweep, India. The atoll has a roughly rectangular shape and is 8.1 km in length with a maximum width of 4.2 km. 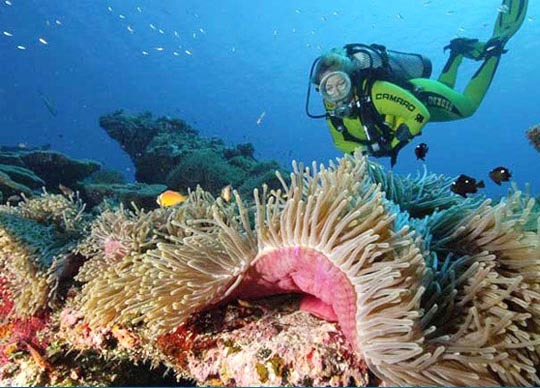 It is located over 400 km off Kochi in the Indian Ocean. Full day at leisure on the Bangaram Island or enjoy the water games or take a swim and sunbath. After breakfast depart Bangaram Island for Aggati Airport by boat cruise in time to catch flight for Cochin. Upon arrival at Cochin our Representative will meet you at the airport and transfer you for onwards destination.